Daisy | Boxer in Long island city. 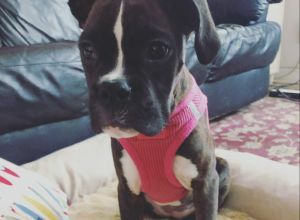 Daisy is a sweet brindle boxer pup. She is 4.5 months old and fully up to date on vaccinations. Would love for her to have the opportunity to socialize with other dogs!